Neo40 Professional is a clinically proven and patented supplement that contains vitamin C, a specific amino acid derived from protein and a combination of other ingredients that produce nitric oxide. This unique composition of matter is protected by 8 issued US and international patents and has been proven effective in 6 peer reviewed published clinical studies. Nitric oxide supplements are taken because at a young age our bodies are capable of producing large amounts of (NO) but after the age of 40 the decrease in the production starts which leads to various cardiovascular disorders. Neo40 Professional is recommended to be taken to increase and balance the NO levels present in the body for the improvement of health and restore normal physiological processes which helps support normal structure and function of the human body. “The discovery of nitric oxide and its function is one of the most important in the history of cardiovascular medicine” says Dr. Valentin Fuster, President of The American Heart Association. Neo40 Professional supplements are easy to take and easily dissolve on the tongue, they contain some additional vitamins that help with the improvement of the overall health by increasing the energy levels and promote mental health. 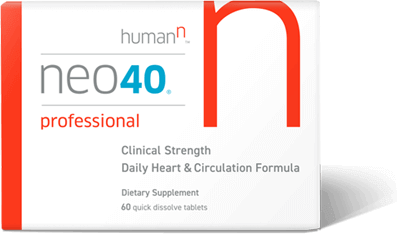 The supplement Neo40 Professional helps open up the blood vessels in the body to stimulate healthy circulation. Neo40 Professional achieves this task by activating the immediate production of nitric oxide gas as it is dissolving. Neo40 also fixes the enzyme responsible for the conversion of the amino acid named L-Arginine to nitric oxide thereby improving the body’s own ability to produce NO. This leads to an improvement in endothelial function and activity. + HOW TO FIND OUT IF YOU NEED NEO40 PROFESSIONAL RESTORATION? Nitric oxide indicator strips are used to indicate the amount of nitric oxide present in the saliva to find out if you need NO restoration. So far there are no possible side effects reported but a consultation with the physician is important before taking the product. Nitric oxide (NO) is known to be the most vital controlling molecules present in the body hence it has a great ability of stimulating the stem cells as desired. The body’s natural immune system is very much related to the NO production and it plays a significant role in eliminating tumors and various infectious agents. Nitric oxide is known to be involved in the differentiation of cells because it is mainly responsible for the communication between the various cells of the body so with the effect of nitric oxide induced the stem cells trigger various cellular responses that aid in the improvement of health and immune system response. Nitric oxide works along with the mesenchymal cells that are also called the immune modulators that aid in making the stem cell network more useful for cell repair.